Crumb-topped coffee cakes are my favorite kind. That’s why I wanted to try this recipe–it’s actually a blueberry coffee cake recipe, but I substituted the blackberries I had recently picked. I doubled the original recipe so I could make it in a 9 x 13″ pan, but when it came to the topping, I doubled it twice because the original topping amounts seemed a little small. I’m glad I did that, because the topping ended up being just right–not too heavy and not too light. The top of this crumble-covered coffee cake is a little bumpy, just so you know what to expect, and inside it’s moistened by the juicy blackberries and small chunks of cream cheese that are stirred into the batter. It’s great for a summer breakfast or brunch and a great way to use your blackberries! Preheat oven to 375˚F. Grease a 9 x 13″ baking pan; set aside. In large bowl, cream butter and sugar until light and fluffy. Beat in eggs; set aside. In medium size bowl, combine 2 cups of the flour, baking powder, and salt; gradually add to creamed butter mixture alternately with Half & Half and milk. In another medium size bowl, toss blackberries with remaining 1/4 cup of flour. Stir the blackberries and cubes of cream cheese into batter (batter will be thick). Spoon batter into prepared 9 x 13″ baking pan. For topping, in a small bowl, combine flour and sugar. Cut in butter until mixture is crumbly. Sprinkle over batter. Bake at 375˚F for 40 minutes or until a toothpick inserted in center comes out clean. Cool on a wire rack, then cut into squares and serve. Note: If using frozen blackberries (or blueberries), use without thawing to avoid discoloring the batter. Fresh blackberries taste great in so many things! I still have a few more blackberry recipes I’ll be posting soon! Have you tried any good blackberry recipes this summer? Linked to Fiesta Friday, Simply Sundays, Sunday Features, Inspire Me Monday, Making Memories Monday, Merry Monday, Show and Share, Anti-Procrastination Tuesday, Wonderful Wednesday, Wow Me Wednesday, Wow Us Wednesdays, Wake Up Wednesday, Inspiration Thursday, Full Plate Thursday, Create It Thursday, Thursday Favorite Things, Showcase Your Talent Thursday, Treasure Hunt Thursday, Share Your Style, Fabulous Foodie Fridays, Feathered Nest Friday. 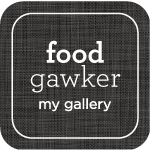 This entry was posted in Breakfast/Brunch, Cakes/Coffe Cakes, Food and Recipes, Fruit and tagged blackberries, coffee cake, crumb topping on August 21, 2015 by nancyc. Ooo that crumb topping looks good! Oh my gosh these sound delicious Nancy! I love the crumb recipes but have never tried a blackberry! Yummmmm. This cake looks delicious, love crumb cakes! Yum! I actually just went blackberry picking this week! I love picking my own because they are all so juicy. It’s awesome how you used the blackberries to keep the inside moist and provides a contrast to the crumble. I can’t wait to see your future blackberry creations as well. There is nothing like a yummy piece of crumble 😀 Love the Blackberry-coffee combo! Thanks for sharing them with us, Nancy 🙂 Enjoy the weekend! This looks so yummy. Love blackberries. I can’t believe you get cream cheese in this, too! Yum! As if blackberries and crumbs weren’t enough. 🙂 This sounds amazing, Nancy! Yum! This sounds so delicious, Nancy! Thanks for sharing at Inspiration Thursday! Have a great week! Yum! I am glad you did more crumb topping too, that looks perfect! I love the idea of having little cubes of cream cheese in there too. Thank you for sharing this yummy recipe at Show and Share (I love me some blackberries). 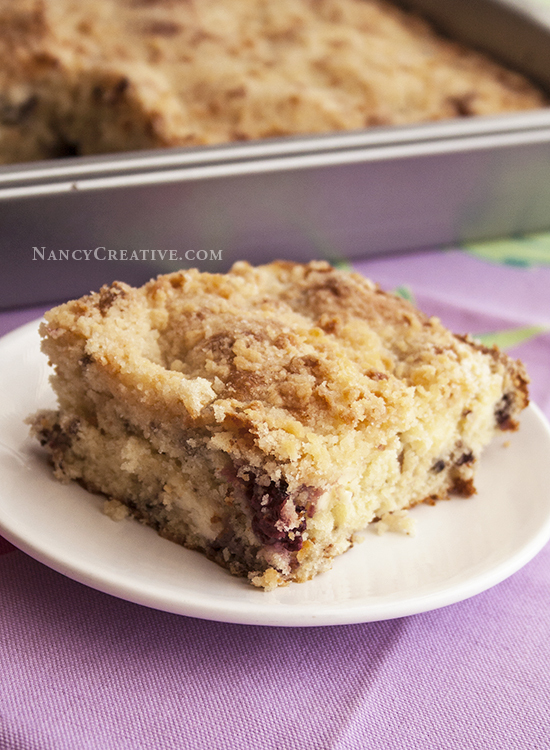 MMmmm, crumb-topped coffee cakes are my favorites, too, and this one looks delicious! I’m looking forward to trying this recipe out. Thanks for sharing at the Merry Monday Link Party! 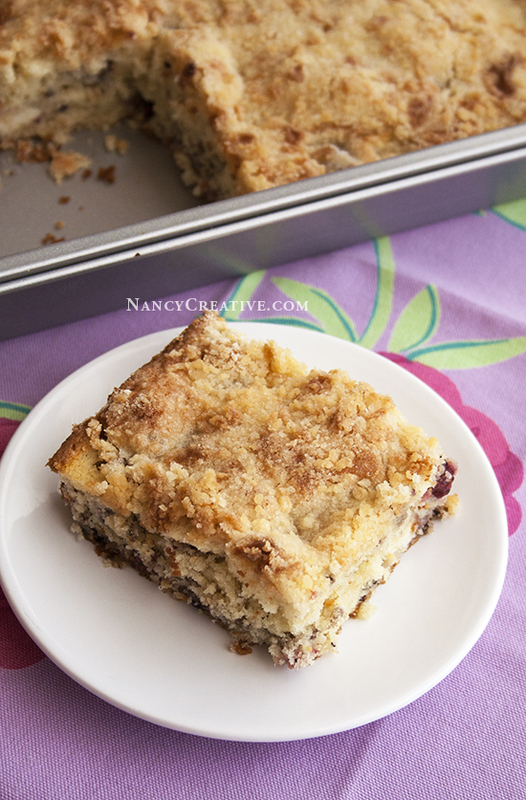 Your Blackberry Crumb Coffee Cake looks fabulous. Thanks so much for sharing with us at Full Plate Thursday and have a great week! Any fruit crumble is yummy!